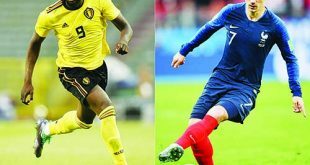 MOSCOW, July 15, (Agencies): France won their second World Cup 20 years after their maiden triumph on Sunday, seeing off a dogged and desperate Croatia side who refused to lie down in one of the most electrifying finals in recent years. The breathless 4-2 victory under stormy skies at Moscow’s Luzhniki Stadium means Didier Deschamps’ side – balancing youthful vitality and tournament nous – have buried the pain of their defeat in the Euro 2016 final on home soil. For Croatia, a country of just four million people, the loss spells bitter pain but fans at home will celebrate the best run in the nation’s history, which featured a stunning win against Argentina and a semifinal victory against England. France captain Hugo Lloris lifted the World Cup trophy as torrential rain fell, mixing with a shower of glitter. Deschamps hailed his side’s “wonderful” victory. “It’s so beautiful, so wonderful,” Deschamps told French TV channel TF1. US President Donald Trump quickly sent congratulations to France and also praised Russia’s president for hosting the tournament. Earlier, Croatia’s fans, massed behind Danijel Subasic’s goal, unveiled an enormous flag during their national anthem and their side roared out of the blocks, pinning France back in their own half. It was the French who scored first, courtesy of an own goal in the 18th minute by Mario Mandzukic following an Antoine Griezmann free-kick but they were pegged back by a lovely Ivan Perisic strike 10 minutes later. Griezmann restored France’s lead from the penalty spot after the referee awarded a controversial spot-kick with the help of VAR (video assistant referee) for a hand ball. As thunder rolled around the stadium, Griezmann lined up the penalty, holding the ball under his arm. Croatia goalkeeper Subasic did his best to put the French striker off but he held his nerve to lash the spot-kick into the net. Croatia were into their stride quickly in the second half, with the brilliant Luka Modric pulling the strings in midfield as roars of “Croatia” echoed round the stadium. But Manchester United’s Paul Pogba extended France’s lead within a quarter of an hour, stroking the ball home – sparking scenes of joy behind the goal from French fans. Kylian Mbappe appeared to make sure just minutes later. But Croatia were given renewed hope when Mandzukic made the most of a mistake by France goalkeeper Hugo Lloris. For France, it was a tournament that started slowly before gathering tremendous momentum. They beat Australia and Peru by the odd goal before a goalless stalemate with Denmark saw them top the group. 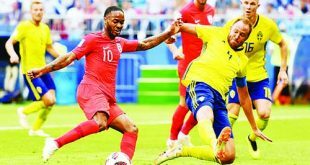 But they moved up through the gears in the knockout stages, seeing off Lionel Messi’s Argentina in a seven-goal thriller before cruising to a 2-0 win against Uruguay and edging Belgium 1-0 in the semifinal. For Croatia, the match in Moscow was perhaps one too far after they were taken to extra-time for three consecutive games. Deschamps, who captained France when they lifted the World Cup in 1998, has become just the third man to win the trophy as both a player and a manager after Franz Beckenbauer and Mario Zagallo. 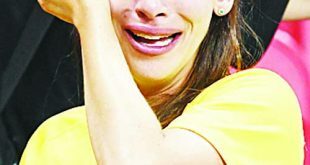 Croatia brought joy to their Balkan nation of just four million people by defying the odds to progress to the final while reigning champions Germany, then Argentina and Brazil all fell by the wayside in Russia. Red-and-white chequerboard patterns were everywhere in Croatia, on cars, in shop windows, trams, buses as well as on jerseys worn by waiters, shop workers or TV presenters. Football fever has slowly built over the past four weeks as France took its young national team to heart, with ecstatic scenes on Paris’ Champs-Elysees avenue after their semifinal victory. Around 90,000 fans converged on a fanzone next to the Eiffel Tower to watch the final. “Congratulations to France, who played extraordinary soccer, on winning the 2018 World Cup,” Trump said on Twitter. Trump on Monday is to meet his Russian counterpart Vladimir Putin for a summit in Helsinki. Croatia’s Luka Modric won the best player of the World Cup award, with Mbappe picking up the prize for best young player. Belgium stopper Thibaut Courtois was named the best goalkeeper of the tournament. His Highness the Amir Sheikh Sabah Al-Ahmad Al-Jaber Al-Sabah sent Sunday a cable to the President of France Emmanuel Macron, congratulating him on national football team winning the 2018 FIFA World Cup, held in Russia. His Highness the Amir praised the exceptional performance of the French national team throughout the competition that lead to winning on a world-class stage with great sportsmanship, which was presented by all the participating teams. His Highness the Amir commended the outstandingly effort of Russia in hosting the competition, and the preparations leading to its success, which contributed to the achievement of its noble and desired goals. His Highness the Crown Prince Sheikh Nawaf Al-Ahmad Al-Jaber Al-Sabah and His Highness the Prime Minister Sheikh Jaber Al-Mubarak Al-Hamad Al-Sabah sent similar cables.